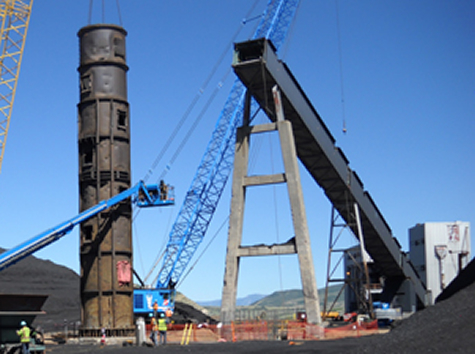 Marietta Silos is a nationwide leader in constructing concrete silos for bulk storage. Concrete Silos are favored over steel silos because they are an economically logical solution that can be designed to resist internal abrasive wear while withstanding pressures that would cause steel silos to buckle. Over time, concrete storage silos are less costly to maintain – lifetime savings can reach 50-70% over steel construction. As steel structures battle costly corrosion issues – especially when contents have moisture or are corrosive – regular repair of rust areas as well as exterior cleaning and painting is required. Further, steel silos often need internal repairs requiring the silo to be emptied, creating costly down-time and inconvenience. Concrete Silos cannot rust and require no exterior painting or cleaning. Additionally, repairs are usually made to the outside of concrete silos without disturbing the contents within. Concrete silos are typically lower in cost than metal silos. Concrete silos have good resistance to corrosion. This includes both corrosion of internal walls due to the stored bulk solid and also external corrosion caused by moisture. Metal corrosion is a well-known problem. No need for expensive painting of silos due to corrosion thus lowering operational cost. There is no concern about electrolytic effects at welds or liner connections. Careless detailing of metal walls may leave inward facing ledges or welds, which can obstruct flow and increase wall pressures. This is avoided with concrete. Concrete is better able to resist abrasive wear than most metals. Concrete is more robust and thus better able to withstand internal pressure loads and impact loads. Concrete has higher wall friction angles with most bulk solids than most metals. This results in higher frictional drag down the cylinder walls and hence lower pressures acting normal (i.e. perpendicular) to cylinder and hopper walls. There is no concern about weld quality or stress risers, such as bolted connections. There is no concern about leakage to the environment.